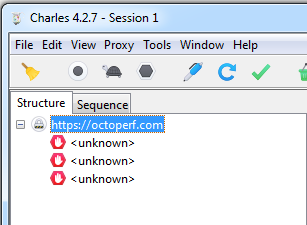 Charles is a web-proxy which allows to capture HTTP and HTTPS requests and responses. Charles is very simple to use once configured. It allows to record HTTP scenarios within minutes. Download Charles and install it. Then, launch Charles. 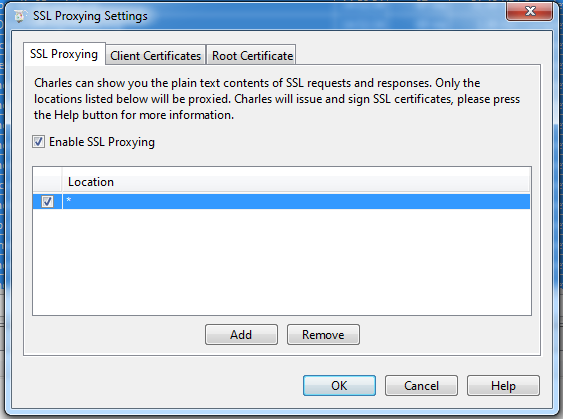 It should configure the HTTP proxy automatically on your browser and starts recording HTTP requests. This is because we also need to trust Charles certificate: Select install certificate and follow through the end of the procedure. Record your scenario by browsing with your favorite web-browser. The requests and responses should appear in Charles. We strongly recommend using the sequence tab to preserve the request order: Once finished, remove any unwanted request from the list before saving exporting your recorded charles sessions. To export, select all requests with CTRL+A and right click: Then save it as an HAR file on your disk. Great, we're just one step behind having a virtual user created from a Charles recording. Import the previously saved HAR file on OctoPerf. Simply drop the file in the HAR area or use the Choose File button. The download starts automatically. You will end up with a virtual user created from your recorded HAR file. This user simulates exactly the same actions as you did in your web-browser during the recording.